‘It’s no secret SEO used to be much simpler than it is today, and the domain name you chose could have a massive impact on the rankings of your website. However, things are now more complicated, and Google has essentially improved their algorithm over the past few years. All of this has been done in an effort to combat an abuse of exact match keyword domain names. The practice may have originated from companies buying a domain name that was a little bit more than a keyword. There may come a time in your website’s life when you wish to change domain names. Whether due to a rebrand or a better URL becoming available, changing domain names is a big decision and can have some major impact for your brand and your websites rankings. Thus, it requires a great deal of planning, rather than swapping and hope that it doesn’t hurt your current rankings. In today’s digital landscape, we are going to run through some critical things to keep in mind when planning your domain name update. So, what are the steps required to successfully switch across? In order to ensure that the transition is smooth and successful ensure that you audit and put mitigations in place before moving. First step is to run the all-important SEO audit on all your statistics before you initiate a transfer of domain name. It will help you by providing a better understanding of everything going on with your domain. PLUS a good benchmark to see any progress or regression after the switch occurs. The most important thing to audit is the list of the inbound links coming to your site. Inbound links to your site are extremely valuable, especially because they are one of the biggest SEO ranking factors. When changing domain name, you want to minimise losing any good links. You can do a link audit in two ways. 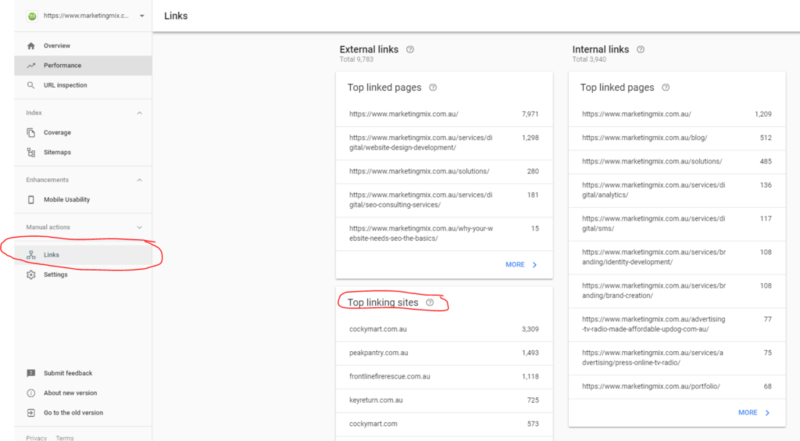 The first is to simply go into your Google Search Console (formerly known as Google Webmaster Tools) and on the left side click the “Links” menu. This will show you all the links coming into your site that Google recognizes. You should export the list for your records. Another way to do a link audit is to use a tool such as Moz’s Link Explorer to review your link profile. This can give you some additional insight into the links and the quality of the links coming to your domain. There are many other systems that are available to help with this but if you self-manage your digital marketing, using Google Search Console & Moz’s Link Explorer will be enough. Next, run through all these links and evaluate the toxicity score of each, looking for the best-quality ones and highlighting them. You should revisit and check that the best links are still linked and 301 redirecting properly after you transfer domains. You also want to use Google Search Console to do an audit on the top keywords that people are searching for that drive land them on your website. Setting up a 301 redirect is essentially a way to send the user to the right page when they try to visit your old URL. Another significant use is it tells Google that your page has been permanently moved and transfer the link credit to the new page. What is critical here is that you 301 redirect everything, particularly on a domain-name level. The quickest and easiest ways to create your redirects are to add them directly into your .htacess file which will reside within your web hosting account. You can create what is called a “wild card” redirect that will transfer everything on a domain-name level. Essentially, this automatically adds a 301 redirect to all your old domain URLs and pushes them to the new domain with the same URL. It’s critical that you take your time and ensure everything is getting 301 redirected properly. This is very important for both traffic and search. Try to keep the exact same URL structure while switching domains. Making large changes are hard to deal with, so it is best practice to leave it the same as it was on your old domain. Leaving like this makes it far easier to manage, test and review. If you want to make changes to the URL structure, it’s best to wait a few months after the domain transfer. Once things have settled, then make your changes. If you are using the new version of Google Search Console, just note you will need to swap back to the old version of Google Search Console ☹ When you click on the little gear icon, you’ll find a link to “Change of Address”. This step is very important and means that the search engine will update your domain in its system and all your listings will be modified accordingly. If you have never used Google Search Console, you can learn more about this useful tool here. Check – and Recheck – Everything! When you take the leap to migrate, double and triple check that everything is linked properly and 301 redirected properly. Use a keyword audit to go through all the keywords that were driving people to your site and search for them on Google. After that, check that they are 301 redirecting properly. This can be extremely difficult if you have a large site (e.g. ecommerce) but definitely check top ranking pages. A 404 error happens when a page doesn’t get redirected properly or the page can’t be located. You should have a tool that you can use to monitor and update any 404 errors that might occur. Check every day for the first week and update any pages that might have 404 errors. We highly recommend that you go back and check once a week for the first month afterwards. It will make it easier to keep track of any 404 errors that might happen after the launch. Just note that it can take a few weeks for some of these issues to pop up. As you can see, the whole procedure can take a lot of time and effort. Often, people under-budget the amount of time required. Make sure you allocate enough time to do a good job of completing everything listed above. Changing domains can affect your search referral traffic, but your site and your rankings should recover if you performed all the necessities in making sure your move is properly executed. Some notable sites have made domain changes and planned their move over a 6 month period leading up to the switch. We are armed with a team of proficient marketing enthusiasts and due to their relentless work towards achieving the best results, we have been delivering a consistent performance in the realm of digital marketing. Contact us now!